devicesI was almost exasperated and facing the possibility of giving up the idea of sea kayaking when out of nowhere fate stepped in and made available a used, expedition built, Pittarak. At first sight it showed promise with its soft curved chines, with most of the volume centred around the paddler, it’s neutral buoyancy and it’s incisive, scalpel- like bow and the small, intimate cockpit. It only took a few seconds of paddling to realize that this was the kayak for me. It was agile, responsive, and loose and had a great rhythm about it as you paddled, while requiring small corrective strokes to control it. I should add that I am 175 cm high and weigh 75 Kg. In the months that followed I modified the kayak in a number of ways in order to create the unison between the kayak and myself. I inserted another bulkhead in front of the existing one and created another airtight compartment by adding a small hatch in the existing bulkhead. This had the effect of reducing the floodable cockpit volume and at the same time providing me with a firm and spacious support for my feet. Ten mm closed cell foam was glued onto the undersides of the deck for thigh supports and to avoid chaffing on the exposed composite surface. Thigh chocks completed the feeling of being at one with the kayak. The rudder apparatus was removed and I committed to learning how to paddle without rudder, the theory being that it improved overall skill levels. I embarked on a program of blade skills development, strength increase through gym work, and the mastering of the Eskimo roll and eventually gained the Proficiency award. It took many months to develop sufficient skills to enable me to go on increasingly challenging paddles with the club. As my skill level increased, I discovered that the Pittarak was becoming more responsive and more easily controlled. Edging and leaning the kayak when combined with advanced blade skills, delivered a new world of possibilities with respect to control. The learning still goes on. Despite its relatively short LOA it could still be propelled quickly if you focused on your forward paddling technique and edged the kayak to your advantage in more challenging conditions. At all times I found the Pittarak an exciting kayak to paddle because it took so little effort to make it respond. The more my skills developed the more exciting the paddling experience became. My experiences culminated in a single thrilling day when I paddled from Ulladulla to Tathra in the first week of January this year. The first two days were fun days with following winds and long surfs on kind and energetic waves. The third day delivered a scorching westerly late in the afternoon which drove sea spray 50-100 meters horizontally across the water and required a lot of sudden bracing in the gusty conditions. It dictated a quick retirement from the water. The fourth day brought headwinds of 20 knots. The sea was 1-2 metres and the swells 1-2 metres. With little effort, the Pittarak surgically sliced its way into this sea. There was so much energy in the ocean that it was pure joy to slide up the waves and power down the other sides, sometimes getting airborne and thudding down on the other side of the crests. The energy of the sea nudged the kayak to the left and to the right. It must have been happenstance because I felt the rhythm of the sea and just used its energy to propel the kayak forward. The kayak just danced in the waves. Sometimes I would experiment by lying flat on the foredeck to reduce my wind resistance and paddled hard to get an increase in speed. It worked so easily. The kayak seemed to be enjoying it as much as I did, as though this was the kayak’s natural environment. All that was required was gentle support strokes and braces, gentle weight shifts, and a sense for when to forward paddle. It was like this for 16 km. Later in the day I wrote in my diary that it was the most exciting paddling I had ever done. To give a newcomer an idea of the sea state, apart from lots of big waves and white water everywhere, and the occasional wave breaking over the kayak, a definitive experience was the sea spray being driven up my nostrils and ending up in the back of my throat on a fairly frequent basis. As with all other sea craft, a quartering sea is still the most challenging aspect of paddling, and this trip has further defined for me the next focus in terms of skills development, but that is another story. 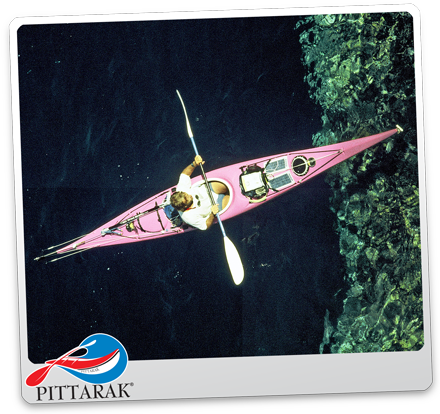 In summary, I believe that the Pittarak is an exceptional kayak for those who want to grow into a kayak, which will enable them to take advantage of the nuances of the ocean in challenging circumstances. 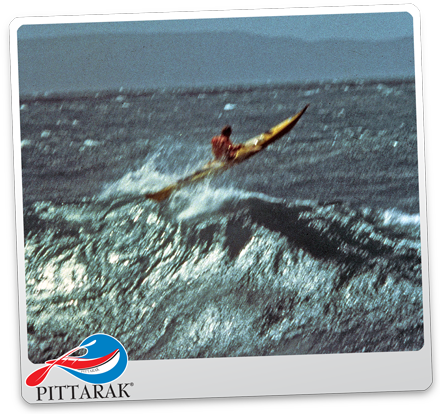 The Pittarak is a demanding mistress but is more than able to satisfy those very fundamental needs of ambitious sea kayakers.